Yesterday, The Jim Henson Company announced that unedited episodes of The Muppet Show will finally be coming to video for the first time later this year. Henson.com says that "Late next month, The Best of The Muppet Show is coming to home video. 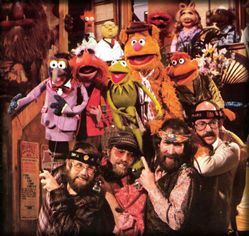 Time Life Video will be releasing complete, uncut episodes of the original Muppet Show on VHS. Each video will feature three shows (introduced by Brian Henson) with bonus scenes never broadcast in the United States. That's 90 minutes of fun and laughter!" Time Life's "best of" series typically include anywhere from 10-20 tapes. So fans can expect a range of possibly 30-60 episodes. The first tape will probably be around $9.99 at a discounted price, and the others will probably be around $14.99-$19.99 each. Tapes are usually purchased monthly, however, on-line there are options to buy all the tapes in a series at one time for 30%-40% off. The Brian Henson intros are likely the same ones seen on Odyssey. It's great that these episodes are supposed to be uncut with UK skits (and hopefully first season intros), however, shocking edits have shown up before so we'll see what happens when the videos are released. It's also quite interesting that these tapes are being released by Time Life and not Columbia's Home Video Library, given that Henson's commercial video contract is with Columbia Tri-Star under the Jim Henson Home Entertainment line. Columbia also releases popular television series on video.